Yesterday for Inktober, I drew Terry Trahan's Box Theory. 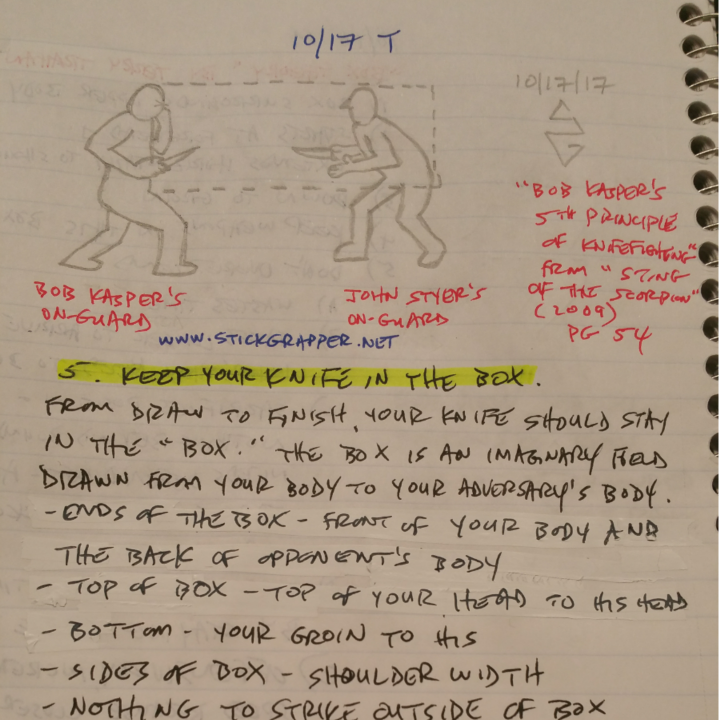 Today, Day 17 of Inktober, I research Bob Kasper's Box Theory and drew a picture. I like this book so much, that I have both the hardcopy and the PDF! Below is my copy and paste of Kasper's 5th Principle - "Stay in the box." Truly hope this project has helped you in your Sojourn of Septillion Steps! 5. Keep your knife in the box. From draw to finish, your knife should stay in the “box.” The box is an imaginary field drawn from your body to your adversary’s body. The ends of the box are made by rectangular planes on the front of your body and the back of your opponent’s body. The top of the box reaches from the top of your head to the top of his head. The bottom of the box is from your groin line to his groin line. The sides of the box are shoulder width from head to groin, reaching out to the plane on the back of the adversary’s body. There is nothing to strike on the outside of this imaginary box, so don’t leave its confines. When your knife leaves the box, you are looping your technique, which makes it more telegraphic and easier to intercept. Keep your strikes compact and efficient. Stay in the box.